JUNE 2015. 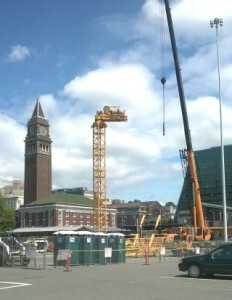 Crews last week assembled the first of two tower cranes that will build a 23-story Embassy Suites hotel for American Life in the parking lot north of CenturyLink Field. When it opens in the third quarter of 2017, the 297-room hotel will sit atop a four-story podium containing 372 parking stalls and 15,000 square feet of pedestrian-level retail space. The hotel will connect by a lofty atrium to a conference center, and a health club with a pool. Hilton will manage the hotel.